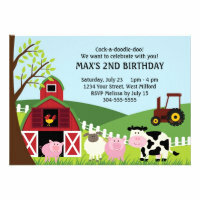 These fun Farm Theme Kids Birthday Party Invitations are a great way to get the party started. 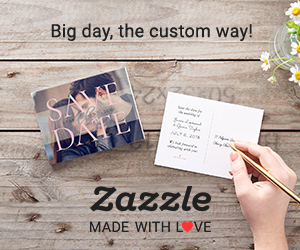 Whether you are hosting a farm themed party or just love farms and farm animals then these cute birthday announcements are perfect. Almost all children love farms and farm animals. All the fun of feeding and petting the animals, riding on tractors and generally getting all dirty and muddy. Themed parties are very popular nowadays, especially fancy dress costume parties. If you are hosting a farm themed party then children could dress up as different farm animals or create their own farmer costume. You could then have a 'best dressed' competition with prize to the winning costume. 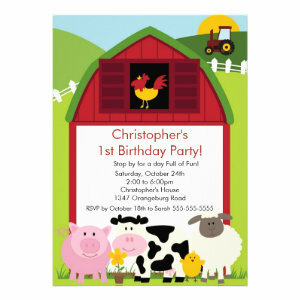 These lovely farm theme birthday invitations can easily be personalized. Change the text colour, font, style and layout. There's also a selection of different paper types to choose from too. 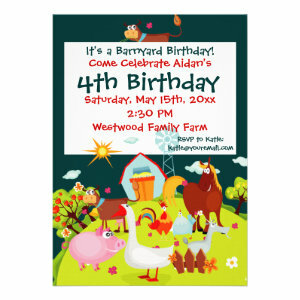 If you are throwing a farm themed party or just absolutely love farms then these Farm Theme Kids Birthday Party Invitations are for you.